Tennessee guard Jordan Bone shoots over Isaiah Joe and Ethan Henderson Tuesday night at Thompson-Boling Arena in Knoxville. If Arkansas Razorback fans needed a reminder of what a very good and possibly great basketball team looked like, they got it Tuesday when the Hogs visited the Tennessee Volunteers. Coach Rick Barnes’ No. 3 Vols throttled the Razorbacks, 106-97, in a game that was never really a contest. As they have since mid December, the Razorbacks (10-6, 1-3 SEC) started slow and found themselves down by double digits quickly and an avalanche of Volunteer points didn’t relent until the Vols (15-1, 4-0) held a 55-34 halftime lead. The Hogs did outscore Tennessee, 53-51, in the second half; however, the only real question of the second half was when and by how much would the Vols break the century mark. From a glance at the box score, the game wouldn’t appear to be such a blowout.The Vols shot 52.6 percent to the Razorbacks 47.8 percent. Tennessee only outrebounded Arkansas by 1, 34-33. The Vols had 17 turnovers to the Hogs’ 19. Looks like a somewhat close game from those numbers. However, the garbage factor of the second half skewed the final stats to a degree. All Tennessee needed to do in the second half was avoid a total collapse, and they could coast to an easy win, which is essentially what happened. The truly telling stats were Arkansas’ first-half shooting percentage of 37.5 percent compared to the Vols’ 50 percent. Tennessee’s defense squeezed the life out of the Razorbacks from the opening tip, forcing four consecutive turnovers at one juncture that allowed the Vols to build an insurmountable lead. 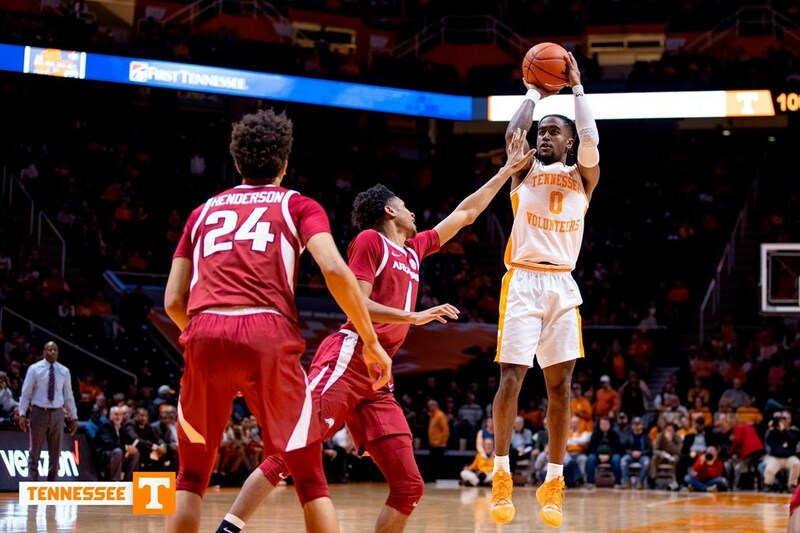 Shooting 52.6 percent from the field is an excellent number for any team, but the Vols also punished Arkansas from the three-point line, nailing 11 of 18 three-pointers for 61.1 percent. Arkansas only connected on 10 of 26 treys for 38.5 percent. That difference loomed large in the lopsided affair. Like all good teams do, Tennessee made Arkansas pay at the free-throw line, hitting 35 of 39 for 89.7 percent. Arkansas continued to hurt itself at the charity stripe, connecting on just 13 of 22 free throws for 59.1 percent. Even if the Razorbacks had connected on every one of their free throws, the Vols would have still blown them out. Tennessee was clearly the more talented, more experienced, and, yes, better-coached basketball team. The Vols are without doubt one of the best teams in the nation, and Barnes certainly has them in that conversation for the best. 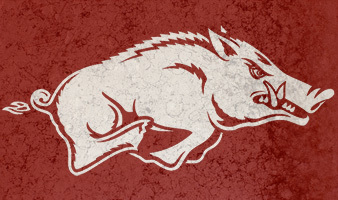 However, there is no getting around the fact that the Hogs’ poor free-throw shooting is truly crippling their efforts. One could fairly successfully argue that Arkansas’ poor free-throw shooting could be the difference in the Razorbacks making the postseason or not. If the Razorbacks averaged a very good but still reasonable 70 percent from the free-throw line, the Hogs could very easily be 13-3, 14-2, or even 15-1 at this juncture of the season instead of 10-6. Free-throw shooting isn’t the Razorbacks’ only issue. Their defense is sketchy against teams that move the ball well, the Hogs have ball flow problems of their own, and the team has a critical gap in talent at the forward spot that can only be rectified through recruiting. But, free-throw shooting is perhaps the most glaring of the Razorbacks’ weaknesses. It is an issue that has plagued them in nearly every game, and certainly in all of their losses. What they mean is that the players need to take it upon themselves to improve their free-throw shooting during their own time, if they are not getting enough work on it in practice. The NCAA only allows players to be on the floor for organized practice and games for 20 hours a week. That time is precious and only a portion of it can be allotted to free-throw shooting. Players that care, work on their free-throw shooting during their own time if that is a deficiency for them. Generally, the bulk of that work is put in during the off-season. If a player has neglected to put in the time and effort to be a good free-throw shooter before the season starts, he’s probably not going to have the time to totally rectify the problem during the season. Now, Anderson and Richardson’s philosophy on practicing free-throws isn’t the only one out there. As Richardson was fond of saying, there is more than one way to skin a cat. There is a management/coaching philosophy that says that you get what you demand. However, there is a mental aspect to shooting free throws, too. Adding more pressure to the situation, might help one player but destroy another’s confidence. Hence, the personal nature of free-throw shooting. Since we’re considering some of Richardson’s old sayings, another he was fond of was that some players play to play, but others play to win. Tennessee is a team that’s playing to win. The Vols didn’t seem cocky, but they were a very confident basketball team. They played with authority, like they were on a mission, and they weren’t going to be deterred. Daniel Gafford might have been the most talented guy on the floor, but he was far from the best player. A lot of that has to do with experience. The Vols are a very experienced basketball team, and that experience coupled with their talent allows them play at very high level individually and collectively. The Razorbacks have talent, but other than Gafford, there is no other player on the squad you could project as certain first-round NBA Draft pick. Even though Gafford has NBA Lottery-like talent, he’s just a sophomore leading a team full of freshmen and sophomores. Experience makes a difference in college basketball. Tennessee is proof. Teams like Duke and great Kentucky teams of the recent past are exceptions not the rule. Even with 16 games under its belt, Arkansas remains an inexperienced basketball team that is going to take its lumps in a very competitive SEC basketball conference this year. However, don’t count the Hogs as totally down and out. Anderson is a tough coach and a good coach whose teams usually play their best basketball from mid-February into March.